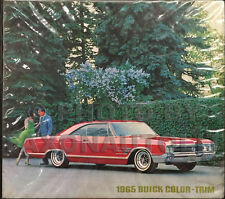 1970 BUICK RIVIERA SKYLARK LESABRE ELECTRA WILDCAT ESTATE/SPORT WAGON GS 455/CONVERTBLE BROCHURE. 1963 Buick Color Upholstery Dealer Album Riviera Skylark LeSabre Electra Etc. Skylark, Century, LeSabre, Regal, Riviera & Park Avenue. 1997 Buick Full Line. Cover is a little scuffed, and has a nick. Otherwise is in very good condition. 1967 Buick Riviera. 1967 Buick LeSabre. 1967 Buick Electra Custom. 1967 Buick LeSabre Custom. 1967 Buick Skylark. 1967 Buick Electra. You will find out the dealer's "inside information" that is far more detailed than a sales brochure. 1976 Buick full line brochure. 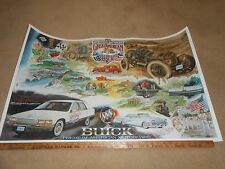 Color photos of: Skyhawk, Skylark, Century, Riviera, LeSabre, Electra and station wagons with all the accessories for all models of all Buicks produced in 1976. In nice condition. 1959 Buick Invicta. 1959 Buick Electra 225. 1959 Buick LeSabre. 1959 Buick Electra. Exact Title: "1959 Buick Facts Book". You will find out the dealer's "inside information" that is far more detailed than a sales brochure. 2011 Buick Enclave. Is in very good condition. 1962 Buick Invicta. Color and upholstery -- examples of the paint and upholstery. However, they are often the only source for hard-to-find upholstery swatches - these are actual fabric samples and not printed images. 2000 Buick Century. 9 1/8" x 11 1/8". 2009 Buick Enclave. Is in very good condition. 2009 Buick Lucerne. Is in very good condition. 2000 Buick LeSabre. Upper right corner has a slight bend, otherwise is in very good condition. 9 1/8" x 11 1/8". 1970 Buick GSX. Buick GSX Specifications. Regress Press. Component Illustration. Illustration with Caption. 2000 Buick Regal. 9 1/8" x 11 1/8". Good condition. This issue is about Atlanta GA, PA turnpike, Coronado NM, Cuba, lesson on how engine produces power, and more. Details: W 8.5 xH 11 xD 0.15Weight 3. 1950 Buick Color Fold Out Catalog Code on the back: 500 M--1-51 Printed in USA Measures when folded approximately 10.75" x 7.75" Good Used Condition--see pictures for condition description. 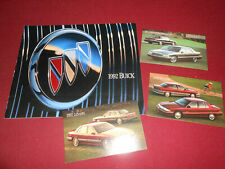 Here we have a1983 Buick Full Line DELUXE sales brochure. This is an original brochure NOT a reprint. Features of each model are highlighted with OPTIONS and SPECIFICATIONS. 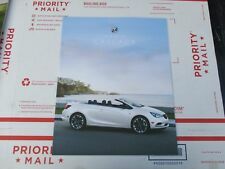 Buick's reference number on this brochure is 83-BA-001. Excellent cover, first and last page show yellowing. all other pages are good, no writing or fingerprints. You will find out the dealer's "inside information" that is far more detailed than a sales brochure. Buy now to be one of the few collectors to own this privileged information. 1956 Buick Century. 1956 Buick Super. 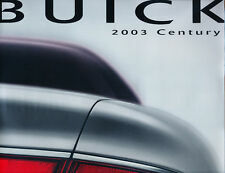 2007 Buick Lucerne sales brochure. This is an ORIGINAL brochure NOT a reprint. 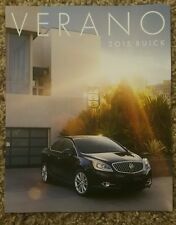 This brochure covers the following models Features of this brochure Buick's ref # 07BULU08-01-25. This is original sales literature right off the showroom floor. 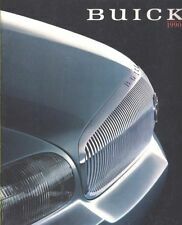 The brochure was created to show off the ultra-rare 1999 Silver Arrow, but also includes a history of Riviera written buy Buick. You will find clear, color pictures and illustrations of the interior and exterior of the rare and limited 1999 Riviera Silver Arrow. You will also find the history of the Riviera from 1963-1999. It's filled with dozens of color photos. 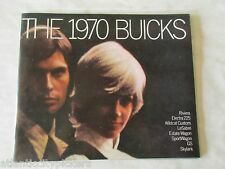 Buy now for this original sales catalog from Buick. 2011 Buick LaCrosse. Is in very good condition. Great brochure! XCL condition,,XCL communication. we have literature on most every car ever made.just ask! Knows Brochures, Professional, Finds The Hard To Get, Honest, Would Buy Again. # of pages : 49. 1970 Buick Wildcat Custom. 1970 Buick Riviera. 1970 Buick LeSabre. 1970 Buick Skylark 350. 1970 Buick Electra 225 Custom. 1970 Buick LeSabre Custom. 1970 Buick Skylark. 1970 Buick Electra 225. The binder is in very nice condition. 215 pages plus and also includes a Salesman's Workbook. Sale is final. 1953 Buick Skylark. You will find out the dealer's "inside information" that is far more detailed than a sales brochure. Buy now to be one of the few collectors to own this privileged information. 1953 Buick Super. Good condition. This issue is about fishing for sponge, Christmas tree Bontanists, Saint Paul's Winter Carnival, how test drivers stay safe, 1940 new car testimonials, NY and Detroit car shows, and traffic education. 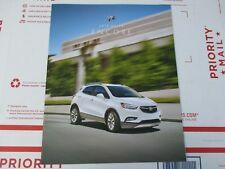 This is a reprint of the confidential manual written by Buick Engineering staff to train salespeople on the features of the new models. This book describes mechanical and styling improvements of vehicles by explaining in detail how vehicles changed from the previous year. You will find detailed interior/exterior photos and specifications. The main engineering features portion of the book is 26 pages, followed by five sections of 24 pages each detailing the AMA specs for each model. See detailed specifications for body dimensions, power teams, engines, cooling systems, electrical, brakes, steering, and suspension. Some of the information in this manual can't be found anywhere else. 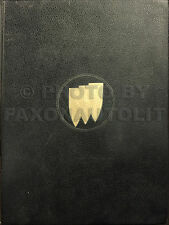 Buy now for this hard to find book..
1954 Buick Skylark. You will find out the dealer's "inside information" that is far more detailed than a sales brochure. Buy now to be one of the few collectors to own this privileged information. Exact Title: "The Facts About Your '54 Buick". Original 1961 Buick Dealer Sales Portfolio. It is in very good condition with minor wear [see photos]. 2011 Buick Regal. Is in very good condition. Brochure outlines the new 2019 Regal TourX along with color options. 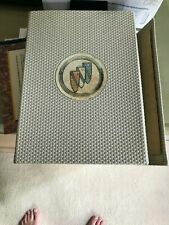 '55 Buick Roadmaster Super Century Special DELUXE 32 pg sales brochure w/ BONUS!